The Law Library reserves the right to cancel reservations made by students who attempt to abuse the system. Yellow boxes indicate rooms and times that are free to be reserved. Gold boxes indicate the reservation you are in the process of making. Maroon boxes indicate other people's reservations. Note: there are two room categories, representing different types of rooms available. Reservations are made in half hour-long blocks, represented by columns in the grid. Each room has its own row. 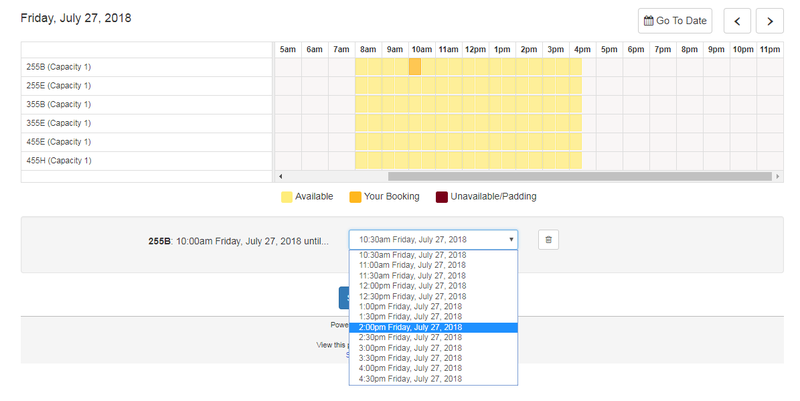 To make a reservation, click on the block that corresponds to the start time for the room you wish to reserve. 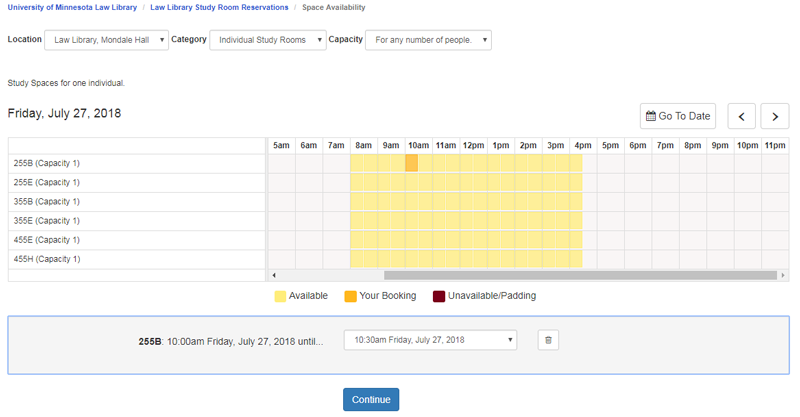 A box will appear under the room grid displaying your reservation start time. Click the drop down menu and select what time you would like your reservation to end. Click the "Continue" button to move to the next page. Review your reservation times and click the "Continue" button at the bottom of the page. On the final page, make sure your name is displayed as the reservation owner. Click "Submit Reservation." You will be limited to 8 hours total per day, whether in one reservation or several. You may make reservations up to three days in advance. An error will be given if you try to make a reservation outside the allowed range. Don't forget to click the "Submit Reservation" button to complete your reservation. Email Confirmation: An email will be sent to your UMN email account to confirm your reservation. To cancel a reservation, find the reservation confirmation email in your inbox. Click on the "To cancel this reservation" link. Find the reservation you would like to cancel and click "Cancel Booking" on the right side of the page.